Batwoman: after a number of false starts, Batwoman is finally back. JH Williams III is a sequential art master whose pages probably make industry veterans jealous. If you want to get someone into comic books, this is the title to give them. It’s lush. It’s extremely well-wrtiten by Williams and Blackman and it’s extremely accessible but has all sorts of “easter eggs” for old farts like me. I am quite glad to have Batwoman back in my rotation. Demon Knights: finally, a book for the LARP crowd. Am I right, ladies? In all seriousness, Cornell is in his element with this title. The setup is dirt simple. The characters are blank slates and the action is over the top. This is meant to be a “fun” book and that tone comes across despite the misleading cover. This book benefits by not being a “super hero” title (even though it has magic elements) and I suspect most people, myself included, will enjoy having this in their pull to break put the monotony of traditional super hero titles. Frankenstein, Agent of S.H.A.D.E. : Lemire is 2-0 with Animal Man and now this title. This is a quirky over-the-top blend of high concept science fiction and dark humor that when put together is a ton of fun. This title reminds me of Warren Ellis Stormwatch mashed up with odd 1980’s indie comic books. I liked the Flashpoint mini-series and I’m on board for the regular series. Green Lantern: since Geoff Johns started writing Green Lantern, this title has always been consistent and it’s never bad. I would say the same for this new issue. It’s a lot of setup and I can’t say I know where it’s going, but I’ve been enjoying the ride so far and there’s no reason to stop any time soon. Grifter: the cover was extremely misleading. Grifter, sadly, is not falling and shooting things. t honestly couldn’t tell you what the heck is happening in this title and I don’t know that it caught my interest per say, but I have a bit of a hunch that something is buried in this book that might be enjoyable and I’m going to try to give it one more shot. Legion Lost: I understand that the conflict for this book will come from the fact that people from the future are going to have to deal with being stuck in the present, but I read enough books about the present. I’d rather read about the future. So, this title gets dropped. Outside of my issues with the setting for this title, there’s nothing “wrong” with this title, per say. It’s very well executed if this is what you’re into. Mister Terrific: I can’t help but feel like this title was trying to make Mister Terrific into the DC version of Iron Man. But if you’re going to compete head-to-head against Marvel, you gotta be as good, or better. The problem is that this title is neither in my opinion. Iron Man is currently being written by one of their strongest writers (Matt Fraction). It’s an unfair matchup and I didn’t find enough to compel me to stay on board. As previously mentioned, I am giving the DC “New 52” titles one issue, 20 pages, to convince me to stick around. Given the sheer bulk of new titles coming out at the same time from one publisher, this lends itself to a somewhat interesting experiment in deconstructing the creation of a perfect first issue (or “jumping on” point) for new readers. I suspect it will be after I do all of my reviews that I’ll post a summary of my finding. In the meantime, here are the reviews. Since I purchase titles primarily based on creators (whom I either follow and/or am interested in), there are a number of books that I passed on. Detective Comics: I am a fan of Tony Daniel’s art, but having tried on a number of occasions to get into his writing, it just wasn’t for me. Others seem to like him, and if I start to see reviews that express his style has changed, I might revisit this title in trade or digitally. O.M.A.C. : the interesting thing here is that I was on board, but then I read the io9 preview and it had the opposite effect on me. Static Shock: love the character, but I’m not convinced that the current creative team can top the original McDuffie/Leon run. Another opportunity for a creative team to prove me wrong and if the chatter is positive, I’ll reconsider. The “gold medal winners” are the books that nailed it in twenty pages and there is no question that I’m on board for the foreseeable future. Justice League: Geoff Johns and Jim Lee have the difficult task of not telling the story of how the League was put together, but also structuring this book in a way that defines the next era of super hero comic books from DC. No pressure. Geoff does character dialogue very well, so it’s no surprise that there’s a good amount of the issue with Batman and Green Lantern (two of the most recognizable characters to new readers) talking to each other. He also uses Jim Lee to his advantage in some beautiful and lush action sequences. As co-publisher, Jim Lee is setting a pace for the other artists in the line with very dynamic and stylized page layouts (see Animal Man, Batwing and Swamp Thing). The interesting thing here is that the mistake for this book would have been to turn it into a Michael Bay explosion fest. That’s the difference between films and comic books. Films are a one time purchase. Comic books require the reader to want to know what happens next and to show up for the next issue and the one after that. By that standard, this book is following the right course and trajectory with it’s cliffhanger ending. 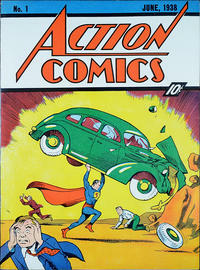 Action Comics: when I think of the people that know Superman. I mean really know Superman. I mean like ‘what was the address of the farm was in Smallville’ know Superman, three people come to mind; Mark Waid, Chris Roberson and Grant Morrison. There are a number of references back to the original Action Comics #1 (including when Superman saves a woman from her abusive husband) and while this Superman is a bit “naive” and maybe “darker,” we all know where this is going to end up. So really what we’re looking at is the journey of how a young man from the midwest meets the city and how it turns him into the greatest superhero of all time. And that journey doesn’t conclude on day one. It takes time. And this is the book where that happens. Animal Man: this, and Swamp Thing, are two books where the author clearly knew exactly the tone they wanted for the title. The first page is a bit of a gimmick, but it pays off strong as the issue progresses. Lemire combines family elements with gothic horror and this is perfectly carried by Travel Foreman’s minimalistic style and beautiful page designs. Animal Man and Swamp Thing are the type of comic book that give new comic book readers a sense of the “cinematography” that an artist can achieve creating a stylized look that they would not find on television or in a film. And it’s not just about dudes in capes (though they do show up). What I also like about this title is that there’s no middle ground. You either loved it, or it’s not for you. Batwing: full disclosure, I am friends with the author (Judd Winick) so while this might come off as a biased review, it doesn’t mean that this title isn’t fantastic. In the 20 pages of this first issue, Judd is able to clearly define how this book is different from Batman in Gotham City. He gives a sense of the place, the people, the characters and all while also providing some great opportunities for artist Ben Oliver to deliver beautifully rendered action sequences. This is the book that is going to come in under the radar and surprise people. It’s written as a straight-up action/superhero comic book, but Judd makes the characters and the setting the real focus and it’s something we’ve not seen before. Swamp Thing: Scott Snyder and Yanick Paquette are following the successful Alan Moore/Steve Bissette/Rick Veitch model for this title; specifically the tone of the early issues with the trippy late 80’s layouts and how ‘nature’ was both a setting and a character that played off of Alec Holland. This is, what I think, is resonating with most of the positive reviews online. People liked that Swamp Thing. This looks like that Swamp Thing. A+B=C. They like this title. And it would be easy for Snyder/Paquette to simply be a “cover band,” but that’s not why these guys are two of the top creators in the business. They are simply using this as a starting point to provide easy access into something that is going to be unique unto the collaboration between the two of them. Already in the first 20 pages I see an increased levels of horror (reminiscent of the Wein/Wrightson run) and a trajectory that in a few issues (or maybe even a few pages) will be referred to in the future as “the Snyder/Paquette” run and not merely a homage. The following are titles I enjoyed, but am putting “on notice” that in another 20 pages, I might not stick around. Stormwatch: if you are a science fiction novel reader, this is your title. No question. Paul Cornell writes science fiction novels and has taken that style of writing to Stormwatch. And it fits perfectly. The problem that this title had is that it references quite a bit of the DC Universe…that nobody has read yet. I’m kind of amazed that editorial chose to put this as a Week 1 book, as opposed to waiting for it to go after certain books (one of which is referenced in this issue but has yet to come out). That shouldn’t (and doesn’t) affect how I felt about this title. I think much of it had to do with so much of this issue being setup, which is why I’d like to stick around and give it another shot. I will not spend too much time on these titles, since I try to stay away from negative reviews. I will say that I read these titles. They were not for me. Green Arrow: this title is being eliminated due in large part to a personal bias I have with regard to comic books that try to cover the technology industry. I work in the industry and it’s hard for me to read about it and not analyze it more than I should. Hawk And Dove: my one complaint with this book had to do with a reveal on the final page and some color issues that confused the heck out of me given some new costume designs for one of the characters. I don’t know, maybe it was just me. Men of War: there were a number of people that I trust who loved this title. I have been spoiled by the Garth Ennis “war stories” from Dynamite (and Vertigo) and wasn’t seeing this book going in that direction. This is a title that I will keep my eye on and could revisit in trade in months to come. * I still do not have any evidence that they hate puppies. It just makes for a fun and salacious headline. The next version of the Mac OS X operating system, Lion, is here! As a part of the “pre-flight” checklist for any operating system upgrade, users should take an inventory of their applications and determine if there are any incompatibilities that need to be fixed prior to the migration. Snow Leopard weeded out most of the incompatible apps when they pulled the Power (legacy) code from the core operating system, but since they did have the emulator (Rosetta) I didn’t quite know for sure if Lion would be a slam dunk or a face plant. Intuit Quicken 2007 For Mac. The bane of my existence. But alas, we don’t. And I use Quicken 2007 For Mac. Yes. This is some old code. It’s older than some of my friends’ kids. Nobody, myself included, expects for a company to support old code forever. I work for a technology company and I’ll be the last to throw stones at a company that makes a decision about the economic feasibility of “legacy” applications. But it’s not a roadmap when it goes into a brick wall. Ideally, the migration path from a legacy application should be to another product in the portfolio. Quicken Essentials: this product (even with their discount) is an over-priced downgrade from the Quicken 2007 product. The reviews for this product when it released were horrible. Windows ME got better reviews. Seriously. The reason being that Intuit did not include much of the core functionality from Quicken 2007 in this product. Mint.Com: this product is a completely different methodology for managing finances, and one that I’m not ready to adopt. Sorry. And, being forced would just make it worse. In addition to the retraining/learning curve to adapt to using Mint.Com I should mention that all of my valuable historic data from Quicken 2007 For Mac can not be imported into Mint.Com. Significant learning curve, lack of functionality and lose of my data means Intuit is 0 for 2. The worst mistake I made when I moved to the Mac platform was going entirely native and giving up Quicken for Windows. In my defense, I wasn’t going to purchase a Windows license + virtual machine software just to run one piece of software. In retrospect it would have been far less aggravating and frustrating if I’d just bit the bullet and spent the extra cash to do exactly that. As a software application, Quicken 2007 For Mac has always been a dud. It’s the ugly cousin of the fabulous Windows versions. And I’m being generous. I’d even go so far as to say that I’d put Quicken 2007 against Quicken versions from the 90’s. You may say that I’m just using hyperbole. I am not. I have been was a loyal Intuit customer since the mid-1990’s. I have used versions of this software that ran on Windows 95. I have Quicken data that goes back to when I was in college. I could tell you how much I paid for the first mattress I bought out of college. Or give you the exact amount of money I spent on comic books in 2003. I had been one of the biggest Inuit fans. That is, until I moved to the Mac and they decided not to follow. It’s probably why I made the mistake of staying with Intuit as long as I have. My product loyalty runs ran deep. But Lion as the forcing issue to jump off Quicken feels like it’s the right thing to do. Goodbye Intuit, you could have kept me as a loyal customer but you couldn’t follow the market trends of so many of your users (myself included) moving to the Mac platform. Which is ironic considering Intuit Board Member Bill Campbell has a long history with Apple. If Intuit had the same great product they had on Windows on the Mac, we wouldn’t be here. I mean. Seriously. Even Microsoft has a good version of Office that runs on the Mac. So. It’s with regret that I am pushing Quicken 2007 For Mac to the curb and moving to IGG Software’s iBank. I download credit card data and categorize my spending. I download bank data and categorize my spending and savings. I generate custom reports to understand my spending. So, as you can see, not too complex. Some UI choices are different. I don’t know if I’d say they are “better” or “worse” then what Intuit does. Just different. And after all, I’ve been using Intuit UI for quite some time. Oh, and it’s in the Mac App Store. Exactly. So, hello IGG Software. Here’s hoping you do right by me and all the other Quicken 2007 For Mac users that follow me. Note: the trial version of iBank is available from their website, but an e-mail to their support said that if you want to install the Mac App Store version – take the evaluation app and throw it in the trash. Purchase the version from the app store, when it runs find your iBank document file and you’re back in business. Also, I do not work for IGGSoftware nor have I been paid (or asked) to write this blog article. My only contact with them was the support e-mail above. As mentioned in the past, I sympathize with the organizers of SDCC. They clearly are trying to maintain a comic book focus for the event, but the Hollywood stuff continues to overpower them. It’s almost like inviting a friend over to watch a football game and he/she doesn’t actually even like football and decides to handle the remote in your living room. You’d like to be a polite host but at the same time, they keep switching channels during the commercials and don’t quite seem to be quick enough to get back to the game when it starts back up. The host can only do so much before they loose control of the situation. …oh, and they won’t take a hint on when to leave. It’s a long way to get to a point, but it leads me to the following question: who the <blank> invited Glee? While television qualifies as a “related popular art form,” the content of said television (Glee) is a stretch. One could argue that so many other things do not qualify either. And Glee is ripe and in season. I have come to accept that SDCC has been co-opted as a “nerd culture” event and that Hollywood stretches the “letter of the law” when it comes to what they bring down to San Diego. So. Here’s what I’d ask of anyone going to SDCC. Don’t go to the Glee panel. Make sure that on Sunday at 10 AM, Hall H is completely empty. Show Hollywood that you’re sick of their non-football liking friend hogging the remote in our living room. The funny thing is, when I started this blog I didn’t know what else was happening on Sunday at 10 AM. The reality is, this is a wealth of comic book goodness. Seriously. Comic books are still at SDCC. You just have to know where to look. And when you can find them, you can be sure that you’ve hit some awesome stuff like that Mark Evanier panel about Jack Kirby. Evanier knew The King. Worked for The King. Wrote a book about The King. This panel is an SDCC mainstay. And to have Walt Simonson there too! C’mon. Or the Teen Comics Workshop. If you are a young adult and looking to get into comics, this is a far better use of your time than watching clips from Glee that you can see on YouTube next week. And what about that Wild Cards panel? Aside from George R.R. Martin being on there, it’s about the process of adapting comic books to prose. I’d pay money just to sit in on something that interesting (especially since I have the old Epic Wild Cards series). So. You can choose from one of these insanely amazing panels. Or sit in a room to watch the producers of Glee show clips. Having Hall H completely empty and packing these comic book panel rooms to the rafters will hopefully send a message to Hollywood: Stop hogging the remote! …and maybe learn something about football before you come over the next time. * yes, Dune is a novel. But it was also a movie and the movie was adapted into a comic book. ** Note: I know that the How-To on Audio Books is not comic book-based. But Scott is a friend and does Brad‘s audio books so I felt the need to plug his panel. In anticipation of Breaking Bad Season 4 (first episode aired last night, and man was it insane), I just finished Season 3 and…wow! I stick with my A+ rating from my earlier review. I stand by everything I said earlier and would like to elaborate on three things that make this one of the best shows on television. So much of television, and in particular procedurals, is plot-driven. Breaking Bad is the opposite. Breaking Bad is character-driven and it is the actions of the characters on the show that progress the plot forward. It is the characters who make the decisions that impact the direction of the show. And they get it wrong more often than they get it right (kinda like in real life). Jesse is a perfect example of this. His decisions are dictated by the ‘what would a f***-up meth dealer and wannabe gangster do?’ and not by the whims of what is convenient for the writer. And he is just the most obvious example. I talked in-depth about this in the earlier review and I stand by the fact that the art and props department (and location scouts) are “JJ Abrams quality” in their ability to set the scene perfectly. I’m always raving on Twitter about how flawless the production design is on Fringe and I gotta say that Breaking Bad is just as good (maybe better). From that stupid Pontiac Aztek to the leather jacket that Walter wore in a flashback, there is never a moment when you are not in the reality of Breaking Bad. Never a moment that you think that you’re watching life and not a Hollywood production. Oh, and those Los Pollos Hermanos commercials are just brilliant. Three words: Gale’s recumbent bicycle. I should also mention that the cinematography and lighting are superb. By far, the biggest strength of Breaking Bad is its extended cast. Dean Norris has shined on this show, but then you get guys like Jonathan Banks (Mike) and…seriously, Jeremiah Bitsui (Victor). The two of them. There’s so much going on with those characters and they just nail it. For Bitsui it’s even more difficult to step up to the challenge since I can’t say he’s said 10 words on the entire show. Which is probably why Mike and Victor are currently my two favorite characters on the show. I should also mention that even though he’s not a character actor, Bob Odenkirk as Saul Goodman might be one of the greatest supporting characters ever. TV Guide, EW and whomever else makes those type of lists needs to make sure he’s in their Top 3 (at least). The entire line of 52 DC #1 reboot titles have been announced, and the following is my pull list / recommendations for September. A few notes up-front about this list. These are my personal recommendations and should be treated as such. If you don’t agree with my recommendations, that’s cool. We’re still friends. 🙂 I encourage you to make your own decisions. My methodology for purchasing comics is that I tend to follow writers. Then artists. Then characters. I wrote about this in great detail in a previous post. A good writer can steer me to buy a book about a character I don’t care about. Example: Geoff Johns on Aquaman (sorry Katy!). But as much as I love Adam Strange, if he’s in a book with a writer I don’t like, I’ll take a pass. My attention span is limited to 20 pages before I loose interest in a reboot title (something covered in my other post under “The DC Challenge”). Meaning, if they don’t wow me with the first issue, I’m not going to stick around for a full story-arc for it to “get better.” Creative teams who are not conscious of the fact that they are fighting for my attention and need to grab me at the jump don’t deserve it. Aquaman (Geoff Johns/Ivan Reis): if Johns and Reis can make Aquaman cool again (and let’s face it, he hasn’t been cool since his days in Detroit), then this will be a book to remember. Wonder Woman (Brian Azzarello / Cliff Chiang): Azzarello often gets left out of conversations about great super hero writers, but if you look at his body of work, he’s written some of the best Superman and Batman stories in the past few years with the Luthor and Joker books. Cliff Chiang is both no stranger to drawing Amazons (see Green Arrow/Black Canary) and a personal favorite artist of mine since his days illustrating Josie Mac. Green Lantern (Geoff Johns/Doug Mahnke and Christian Alamy): while Johns didn’t create Hal Jordan, he has an understanding of how to write this character and that’s made for one of the most consistent books over the past few years. I’m glad he’s staying on this title and look forward to the new run. Batman (Scott Snyder / Greg Capullo): Snyder is coming off of an exceptional run on Detective Comics. My first thought was that he might be misplaced on Batman (as opposed to Detective Comics) since it was his focus on the crime investigation and human elements that made the book such a great read. That said, Snyder is a professional writer and I’m certain he can adapt to work on the flagship title. Batgirl (Gail Simone/Ardian Syaf): while Gail Simone has logged a lot of time writing Barbara Gordon, she hasn’t actually written her as Batgirl. Few have over the past 20 years. So it will be interesting to see how she approaches Barbara back in the role of Batgirl (assuming it is Barbara behind the mask). Batwing (Judd Winick/Ben Oliver): Batman is cool, but Batwing is going to be cooler. This is what the reboot is all about. Taking concepts to places they haven’t been before with characters who might have not been represented in the past. This should be on everyone’s list (and, because I know Judd is gonna knock this out of the park). Batwoman (J.H. Williams III/Haden Blackman/Amy Reeder): this was the most anticipated title of 2011 before the reboot and the fact that it’s still on track is excellent news. Catwoman (Judd Winick/Guillem March): trust me when I tell you, this is gonna be the breakout book of the Bat titles. I spoke to Judd about what he plans to do with this book, and it’s gonna be a page-turner. …and though it’s not launching until 2012, Grant Morrison/Chris Burnham on Batman, Incorporated is also a must buy. Animal Man (Jeff Lemire/Travel Foreman): Lemire excels at telling stories with intimate family moments and I’m hoping that he’s allowed to go “dark” (see above note) with his storytelling here. Read Sweet Tooth. He can do it, it’s a question of will they let him go there. Frankenstein, Agent of SHADE (Jeff Lemire/Alberto Ponticelli): Lemire is clearly one of the new writers that DC is betting heavily on. I’ll be interested to see what he does on this team book and am enjoying his take on the character in Flashpoint. I, Vampire (Josh Fialkov/Andrea Sorrentino): I almost skipped over this book, until I saw that it was Josh Fialkov writing it. His series Echoes was quite good (thanks for the heads up on that, Dan). Again, if he can really go “dark” on this book, that’ll be the difference between a lame vampire book and one that stays in the buy pile. Justice League Dark (Peter Milligan/Mikel Janin): terrible title and while this book was sorta done already in Doom Patrol #53 with the Legion of the Strange (Comics Alliance), I’m hoping Peter Milligan makes this something to talk about like he did when he was writing X-Statix for Marvel. Swamp Thing (Scott Snyder/Yannick Paquette): Snyder is one of their strongest writers right now, and he understands horror (see American Vampire), so it stands to reason they’d put him on the Swamp Thing relaunch. Legion of Super Heroes (Paul Levitz/Francis Portela): not only did Paul Levitz understand the Legion when he wrote the book the first time around, but since he’s been back he’s shown that he’s still got it. The note that I made about the “Dark Side” books is the same note I’d make about these books. Any line called “The Edge” better feel more like a Vertigo crime book and less like a middle-of-the-line DC book, or it might as well be just another title on the shelf. Blackhawks (Mike Costa/Ken Lashley): Costa was part of the G.I. Joe: Cobra book from IDW. That gets him a shot at trying to win me over. Stormwatch (Paul Cornell/Miguel Sepulveda): Cornell won me over with his work on Action Comics. I’m on board (even though Martian Manhunter can be a pretty boring character). Action Comics (Grant Morrison/Rags Morales): Morrison is one of the most imaginative writers working in comics, and he writes stories that make your brain explode (in a good way). It’s almost laughable to think that the man who was once the poster child for Vertigo and seen as being “too weird” is now writing the most iconic comic book character ever created. And Morales is an artist who can do both action and emotion (re-read Identity Crisis and it’s all there). Superman: The Man Of Tomorrow (George Perez/Jesus Merino): in February of 1987, after the Crisis on Infinite Earths rebooted the DC Universe, George Perez rebuilt Wonder Woman from the ashes. Now he will be back to do the same for Superman. DC Universe Presents (Paul Jenkins / Bernard Chang): an anthology is going to be pretty important in filling in some of the “gaps” and quite frankly, I’ve always liked anthologies. Paul Jenkins is a very underrated writer and I’m happy to see him back from working across the street at Marvel. That said, anthologies are hit or miss, so I’ve moved it to this column. The Flash (Francis Manapul and Brian Buccellato): while I love Manpaul / Buccellato as artists, they are unproven as writers and that’s the only reason they’re not in the “strong buy” column. I’m hoping that these two surprise me and push this title over the top. Mister Terrific (Eric Wallace / Roger Robinson): while I have read a few comics from Eric Wallace, I do not have an opinion of him one way or the other. Neither do I for Roger Robinson. This is one of the rare instances where a character (Mister Terrific) is compelling me to try a title. Birds of Prey (Duane Swierczynski/Jesus Saiz): I’ve tried a number of Swierczynski’s Marvel titles, and they never really resonated with me. I’m hoping that the move to DC, the reboot and the fact that he’s on a team book are all enough variables that maybe get me on board with his writing. Detective Comics (Tony Daniel): while I am not a huge fan of Daniel’s writing, the vote of confidence to keep him on Batman as a writer and shift him to this title is enough to make me give it a shot. As a polite reminder to Daniel, I would point out that he has 20 pages to get me to stay on the title. Red Hood And The Outlaws (Scott Lobdell/Kenneth Rocafort): pairing Jason Todd with Roy Harper is enough to get me to check this out. Demon Knights (Paul Cornell/Diogenes Neves): I have very little interest in this book, but the idea of Paul Cornell writing it will at least get me in the door for a first issue. Hawk & Dove (Sterling Gates/Rob Liefeld): Hawk & Dove is what first brought most people to the attention of Rob Liefeld. Say what you will about his art style, but he brings a level of enthusiasm to the page that few artists can match. I should also mention that Sterling Gates is a very talented writer and did some great work on Supergirl (another youth-oriented book). Legion Lost (Fabian Nicieza/Pete Woods): I have very little interest in the concept, but I know that some of Nicieza’s best work was on the New Warriors, so I’m going to give this a shot. Grifter (Nathan Edmondson/CAFU and BIT): Edmonson’s “Who Is Jake Ellis?” from Image is a neat series. I’m a fan of Cafu and Bit, so this book is worth a try. OMAC (Dan DiDio/Keith Giffen and Scott Koblish): the cover image looks more like the Hulk and less like the original OMAC. DiDio is doing what Johns and Lee are doing; working on titles in the trenches with the rest of their creative teams. So that gets him a spot on my list. Sgt. Rock And The Men Of War (Ivan Brandon/Tom Derenick): see my comment about what I’m looking for from the Edge titles. Brandon can write gritty war comics. It’s going to be less about ability and more about if they let him take the title in that direction or keep him in the middle. Supergirl (Michael Green and Mike Johnson/Mahmud Asrar): I’ve enjoyed Michael Green’s books (and TV work) in the past, so he gets a shot to show me what he’ll do for Supergirl. In the mid-1990’s, television talk show host Kathie Lee Gifford was producing a high quality apparel line for K-Mart at affordable prices. Then in 1996, the National Labor Committee reported (Democracy Now) that the clothing was being made in sweatshops with conditions that are too unspeakable to go into in this blog post. I mention that to mention this. Transformers: Dark of the Moon is bananas. B-A-N-A-N-A-S. Bananas. It so crazy and insanely over the top that even with a $200 million (US) budget, I have to wonder if we won’t find out in a few months that none of the actors or crew were paid (or fed) and that the special effects were all done in fifth-world sweatshops in countries we’ve never heard of. But until then! This movie is just insane and worth seeing in a great theater with a nice digital 3D projector (like the Alamo Drafthouse here in Austin). Let’s start with the fact that if I were a kid. This movie would be my jam. Visually, it is incredible. It’s one of the first times where I’ve noticed a director composing his shots for 3D and then actually pulling it off without it being the stupid ‘he that actor is throwing something at me’ nonsense. Rather, subtle things like foreground elements such as lamp posts give this movie the three dimensions that other movies (like Green Lantern) fail to do. The open letter that Michael Bay wrote to theater projectionists and fans was on the money; the theater experience will make or break this movie for you. My older brother convinced me to see this in the theater and he was right to do so. BTW, let’s talk about Green Lantern for a moment. My hatred of Green Lantern is well-known. Transformers delivers all of the awesomeness that Green Lantern did not. I am not lying to you when I say that there is a scene in the first five minutes of the movie that looked more expensive than all of Green Lantern combined. And it lasted for maybe 5 minutes. If that. Michael Bay is a very easy target. He’s made enough bad movies (I saw The Island in the theater, thank you very much) and he’s a “jock” in a world full of nerds. But let’s look past all of that because this is a good movie. Michael Bay does two things that you would think are diametrically opposite of each other very well. He can handle a large budget like $200 million (US) without bankrupting his backers or the studio and at the same time he can stretch a dollar in the way that Sam Raimi and Robert Rodriguez can. The other thing that Bay does quite well is action, and a lot of it has to do with his unique relationship with the military. I recall reading somewhere that after doing Pearl Harbor, the US military has pretty much been open to any request he asks of them (short of doing a Dogs of War thing, I suspect). For instance, the last film was the first use of the V-22 Osprey and this film uses them heavily as well but the drop into Chicago in particular is a scene where you recognize that not only does MIchael Bay have some of the best military tech advisors on speed dial, but he backs up the budget to let them show us some amazing stuff. The script from Ehren Kruger is interesting in that it’s a lot more historical fact-meets-fiction (ala National Treasure and the like). Overall, the story holds together. If I were to scrutinize it, could I find plot holes? Sure. But I almost give it a bit of a pass because the movie progressed at a nice rapid clip and overall it was visual insanity set to screen. The dialogue from Optimus Prime was everything it should be. Every time Peter Cullen speaks it is inspirational and at the same time heroic. I will say that the role of women in this movie was horrible. Seriously. The lack of roles for women in this film outside of girlfriend, horrible boss and assistant probably set the suffrage movement back about 50 years. And yes, that was Keiko Agena aka “Lane” from Gilmore Girls. Also, this movie suffers from what Green Lantern did in that it only credits the screenwriter and not the many hard working individuals who created the comic book and television show. It should be noted that former Editor In Chief of Marvel comics, Jim Shooter, actually created the storyline and character details for the comic, the toys and ultimately the television show. He was not credited. Overall though, this is a fun movie to go see during the summer. Don’t scrutnize it too hard. LIke I said, go to a theater with a good 3D digital projector. Put on the glasses. Have fun. And prepare to see in snanity that is bananas. Brandon at Austin Books did an extremely nice thing for me the other day. He connected me with a private screening of Green Lantern being held by Harry Knowles of Ain’t It Cool News. The attendees were 112 of his friends, family and select fans such as myself. One of the advantages to seeing a movie with Harry Knowles is weird stuff like the Alamo Drafthouse South Lamar theater we were in had been calibrated earlier that morning for another screening he was doing and it was, as he pointed out, probably the best conditions you’d get in seeing a 3D movie. And he was correct. Watching Thor 3D at the Galaxy Highland was like watching the movie through a glass bottom boat. This was a bright, clear-as-day 3D experience. You know how back when you were in high school and the teacher would give an open book exam and there’d be kids that still got answers wrong? Well. In this case, there were 5 guys who got a lot of answers wrong; Greg Berlanti, Michael Green, Marc Guggenheim, Michael Goldenberg and Martin Campbell. It only takes one guy to write the Green Lantern comic book. And that comic book is excellent. Read the Sinestro Corps War, it’ll make your head explode. So, how is it that five guys can’t seem to get out of their own way in making a train wreck of uneven pieces that was Green Lantern? Well, for starters, the script follows all of the beats that you’d expect a “hero’s journey”/Joseph Campbell story to take. Blah blah blah. And I guess that’s the problem. It’s kind of like the movie Salt and how the way that the film was written you’d think you were watching something released in 1986. Also, the budget for this movie was about $200 Million and it’s clear that maybe $5 of that was spent on actually reading the script. Green Lantern has been in steady publication since 1959. There have been so many stories written with Hal Jordan that it should be easy enough to cherry pick the good stuff and leave out the bad stuff. Of course, I had the same reaction when I saw Wolverine: Origin (my review) and as evidenced by both movies, Hollywood seems to have a problem with understanding what good things look like. Just like Wolverine traded in ninjas for a cabin in Canada (yes, really!). Green Lantern traded some of it’s most awesome villains for Hector Hammond. Those sound great, right? Any of those would have been awesome. Instead, we got a smoke monster named Parallax and Hector Hammond. A guy with a big head. As bad as it was to pick Hector Hammond as one of the villains, they also did this thing that I have complained about since Batman (1989). That every first comic book film needs to spend at least 2/3 of the film on the origin story (best origin story in a comic book movie was Blade: done in like 3 minutes). That everything needs to be A-to-B. So, in Batman, Jack Napier needs to be the guy who kills Bruce Wayne’s parents so that when Batman is fighting the Joker he’s actually fighting the guy who killed his parents. It’s stupid. It’s lazy. It’s forced. But that’s Hollywood for ya’. They also made excessive use of callbacks, to the point that they were not so much rewarding as they were condescending. It’s almost as funny as the scene in Wayne’s World 2 where they stop to point out the chicken crates and plate of glass in the middle of the road (“Yeah, you’ve got to wonder if this is gonna pay off later on.“). It’s stupid. It’s lazy. It’s forced. And we’re back in a screenplay from 1988. I was one of the many people who got excited when I read that Kilowag, the trainer of the Green Lanterns, was going to be in the film. The possibilities for what they could do were limitless. That is until I saw the film. For Green Lantern and the $200 Million they had, I don’t know what they were spending it, but it was clearly not for the five minutes Hal Jordan spent learning how to use his ring. That’s correct. When you get a power ring and are recruited to be a space cop. And you’re about to go up against the most powerful force in the universe. You are given a whole five minutes of drill instruction and then apparently you’re set. Seriously. Waiters at TGI Friday’s have more training on their first day than what Hal Jordan was given. But I should point out that those five minutes were not entirely wasted because one of the few things Kilowog did teach him…wouldn’t you know it, it was the thing that helped him save the day later on. There is a huge set piece that involves a helicopter that is going to crash, and of course (spoiler alert) Green Lantern saves the day. Just like Superman saved a helicopter from crashing. Apparently the hazing ritual for the “new guy” is to have them have to save people from a helicopter crash. Ryan Reynolds was fine. He’s not the Hal Jordan from the comic book, but I’m more than OK with how he augmented his performance to match the screen in a similar way that Robert Downey Jr. changed Tony Stark in Iron man. Blake Lively was fine. Mark Strong was fine. The performances were all solid. But the scripting and the pacing to this film were just uneven. This was not a great film. Fifty-plus years of Green Lantern comics suggested that they could have turned in a great film (like Dark Knight, Iron Man, etc.). The script had what could have been some nice character moments, but in execution felt like I was watching an episode of Brothers & Sisters with a quick cut to wide shots of magnificent Oa. Back to watching an episode of Everwood. Cut to what is trying to be something out of Harry Potter castle sequences 101. Also, I should point out that the character choices being made with Sinestro were horrible. Sinestro’s first reaction to Hal Jordan is downright stupid. He thinks that Jordan is not worthy to be the successor to his friend’s legacy. It’s a missed opportunity that makes me wonder if anyone at all working on this movie was thinking of this as a franchise. Think Anakin and Obe Wan in Star Wars. The coolest thing about having a $200 Million Green Lantern movie should be the constructs. Every single penny of that $200 Million should feel like it was spent on making the most insane and elaborate constructs you would never dream of. They should wow you. In my review of Doomsday, I pointed out how that director (Neil Marshall) put every single penny of his $30M on screen. As opposed to this movie that felt like they were always running out of money. In the Roger Corman Fantastic Four (1994), I recall reading that they could only show the Human Torch on fire like 2 times in the entire film. Well, it’s what I thought of when two Green Lanterns who can construct anything they can imagine. They decide to fight each other. With swords. Just plain ol’ swords. Yawn. I should also point out that there’ a very annoying special effect where the actor’s eyes change color when they’re using their power. Guys: I’m watching the movie. You don’t need to turn Hal’s eyes green to let me know he’s using the ring. Nordling of Ain’t-It-Cool accurately points out that Hal Jordan is the reluctant hero…until he has to be the hero and then he steps up because the plot demands it and the script is running out of time. It’s lazy. It’s cliche’. It’s typical Hollywood. It’s 1986 again. Comic book fans such as myself have so been beat down by a string of utterly miserable turkeys and high expectations that never seem to get met that when anything even remotely decent comes along, it gets propped up as being great. Well, I’m here to tell you that Green Lantern is good. Not great. C at best. It used to be that the most that we as comic book fans could ever hope for was that Hollywood didn’t screw things up too badly. But that was then. Films like Iron Man. Spider-Man 2. Dark Knight. They’ve proven that you can make great comic book movies. For $200 Million, we should be treated to something more like the X-Men: First Class and less like Dolph Lundgren’s Punisher (1989). Don’t be apologetic for wanting to have great movies made from comic books. It can be done. And don’t accept garbage and try to pretend that it’s anything but. If I had to give this film any credit, it’s that they opted to not go the Jack Black route (yes, that almost happened, see this article from 2004). My review for Green Lantern will be the next thing I post, but I want to be very clear that this movie is receiving an F as my official rating because it failed to credit any of the writers, artists and editors whose work the film was based on. Bob Kane signed a “sweetheart” deal with Batman that ensured his continued credit for creating the character and cut out his co-creator entirely, a gentleman by the name of Bill Finger. The legal battle between Jack Kirby and Marvel and possibly the most egregious business practice which was where Marvel would stamp the back of their pay checks with contracts that forced creators who needed to endorse them (read: get paid) to have to sign away their labor as “work for hire.” So sign the contract, or starve. While some of these individuals entered these contracts willingly, I think that we can all agree that nobody could anticipate how things would turn out years down the road. Things could have easily imploded, like vaudeville or old time radio, and we wouldn’t be having this conversation. But they didn’t. Instead, companies like DC Comics and Marvel make billions of dollars off of the work of these individuals often without a credit to their names on the work. Contracts have gotten better over the past 20 years or so, but the legacy stuff where the bulk of the money is made, are still pretty dicey and it’s times like this where legal obligation and doing the right thing meet at a crossroads and it defines a company. At the end of the Thor movie, Marvel (see above) surprised many fans with a “Thanks” credit given to a handful of writers and artists whose work clearly influenced the film. It wasn’t something they needed to do. They did it because it’s the right thing to do. When Batman Begins came out, a number of writers and artists whose work was featured in the film received small payments from DC Comics. Which is why when the credits rolled on Green Lantern, people such as myself were in disbelief when the credit simply read: based on the character appearing in DC Comics magazines (or some such boilerplate copy). Considering this was similar wording used in the Superman television series from the 1950’s (when DC was dodging Siegel & Shuster), it would have been laughable if it were not a sad, shameful and pathetic. Warner Brothers and DC Comics should be ashamed of themselves for not stepping up and recognizing the backs on which they are to make millions of dollars. The same company that continues to try to screw the Siegel And Shuster estates at every turn is the same company that did this utterly low-class move. Bill Finger. Yes, the same guy who Bob Kane screwed over. He and an artist by the name of Martin Nodell created the original Green Lantern. An interesting piece of trivia about Nodell is that he worked at the Leo Burnett Agency where he helped create the Pillsbury Doughboy. That character ended publication in 1951 and it wasn’t until the late 1950’s when an editor named Julie Schwartz got the idea to take the names of old DC comic book characters and revive them with “modern” science-fiction backgrounds, something he did successfully with The Flash. Schwartz hired writer John Broome and artist Gil Kane to remake Green Lantern for the modern world. Their version, Hal Jordan, is what the film is based on. In fact, they not only created Hal Jordan, but Hector Hammond. Oa. Guardians. Tomar-Re. Carol Ferris and Sinestro. Even the basic logo/look of the ring (the two horizontal lines with the circle in the middle) came work done by Kane and Nodell. Which is why the way that Warner Brothers and DC Comics chose to credit the creation of this character can be summarized in one word: shameful. The TNT marketing department is wasting no time in trying to get the buzz out for the new show Falling Skies. Social media folks who have high Klout scores were given “VIP” passes to a pre-party last Thursday at the Highball and then preferential seating at a screening of the premiere episode (really episodes 1 & 2) at the Alamo Drafthouse, followed by a Q&A with Moon Bloodgood. Before you think I have Klout score that even ranges within the single digits, I was invited by my friend Kat (@katmandelstein, thanks!). I give the show a B- rating and I will watch it this season to see where it goes. While it’s a good show with a lot of room to grow into itself, the comparisons to the Walking Dead are inevitable and I have to point out that as a result, the bar is being set very high. One of the disadvantages this show has out of the gate are the aliens. When you think about the Walking Dead, the zombies are not an adversary so much as they are an environmental condition. The zombies have no strategy. No plan of attack. They just exist to foil the humans. The conflict is entirely within the confines of the human condition; man vs. man. With Falling Skies, the backdrop of the alien invasion has to divide it’s time between the alien takeover of the planet (“them” vs. us) as well as the human condition elements. Too many unanswered questions (like what’s their end game? etc.). While both conflicts are served, they do tend to go back-and-forth a lot. Not too much has been revealed about the aliens, and I almost would have liked to have had even less information than was given. The reason being, once you start to peel that band-aid you really want to just keep tearing at it until you rip the entire thing off. What if the alien plot becomes more interesting than the people? Stargate always had this problem, where the characters became subservient to the science. These type of shows only work when it balances out evenly (which is a difficult task). While there were a few dark elements that speak to how people will respond to what might be the end of civilization, these things are presented and then quickly tucked away. Which is not a bad thing. It’s just a thing. Steven Spielberg is the executive producer of the show and it airs on TNT, so given both of these facts you kinda know going in that if it ever starts to go into dark territory it’s going to refocus back onto the alien conflict and not linger in the depths of the soul of the downtrodden. For instance: there’s a particular sub-plot about children that should be a lot more disturbing than it actually is and yet they spend very little time on the depth of emotion to be had by this sub-plot and I suspect that later on in the season it will be more about the alien invasion and less about the children affected. Recently, the show “The Killing” had a stand-alone episode that just focused on the detectives and not on the murder they are investigating. Some felt it was a cheat. Others felt it was a brilliant piece of storytelling. If Falling Skies wanted to be cutting-edge, they’d pull a “Lost” and do a show from the perspective of the children at some point. Flip the camera around as it were (Tailies, represent!). But I won’t be holding my breath for that to happen. 10 minutes, maybe. But not a full episode, sadly. The first episode was written by series creator Robert Rodat (Saving Private Ryan) and while it was good, the second episode was the stronger of the two with a number of moments that the audience reacted to (it helps that Graham Yost wrote that second episode). The cast is solid and Noah Wylie is a great lead (as to be expected). I will say that Will Patton kinda sticks out a bit. He’s an amazing actor, but I can’t shake the image of him as the bad guy in The Postman. There’s a post apocalypse “you can’t go home again” joke here; somewhere. The standout of the cast has to be the character Jimmy (Dylan Authors), a solider who only yesterday was a thirteen year-old boy. He doesn’t have a ton of screen time, but when he is in a scene he owns it. I give a huge amount of credit to Falling Skies for getting a leg up on the Walking Dead with this brilliant character. My challenge to this show is to take advantage of him and bring him to the foreground the way that writers did with Kat on Battlestar Galactica. This is a solid show, but it’s also family entertainment. And that’s not a bad thing. It’s got drama. It’s got action. And like I said, if the Walking Dead is a bit too dark of a show, this might be a nice alternative. And, as a counterpoint to that statement: if you do like the Walking Dead, you might like this show as well. Just don’t expect to see someone forced into a “hacksaw” type of decision any time soon. I’ll report back on the blog as the season progresses to let you know where I land on this.